Farfetch. Ever heard of them? Me neither. It's a fashion thing dahling. (400 boutiques. 1 address). So why ask a bunch of food bloggers along to their hidden offices in Old Street? Well for some chocolate tasting of course. Fashion and food are international languages, don't you know, so combining them seems to be the most natural #NextBigThing. 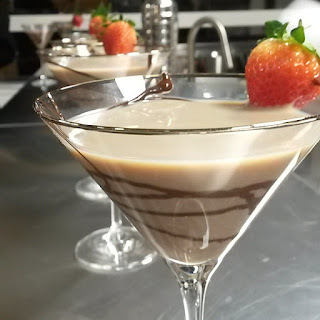 Chocolate Martini anyone? Oh yes, I'll have three please. 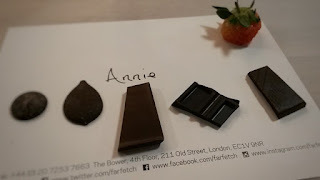 First, Lisa tested our chocoholic levels by passing round testers varying in quality and in flavour. Most of us turned out to be pretty au fait with what was good and what was poor, and nailing it when it came to identifying the flavours: rose, salted, and chilli. Having said that, it was all good fun, and I can tell you that chocolate served at room temperature will bring out all the aromas and flavours immediately it melts in your mouth. Don't eat chocolate straight from the fridge, people. Just don't. Chocolate tasters... the chocolate martini was the best. 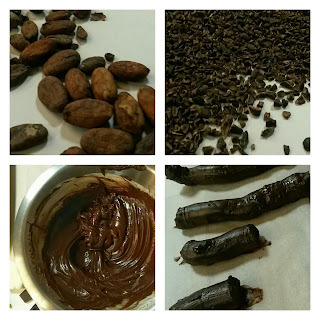 A brief history of chocolate (the first chocolate bar was produced in Bristol), a biography of chocolate (from bean to bar) and two chocolate martinis later, and it was time to make some truffles. The simplicity of it was surprising. 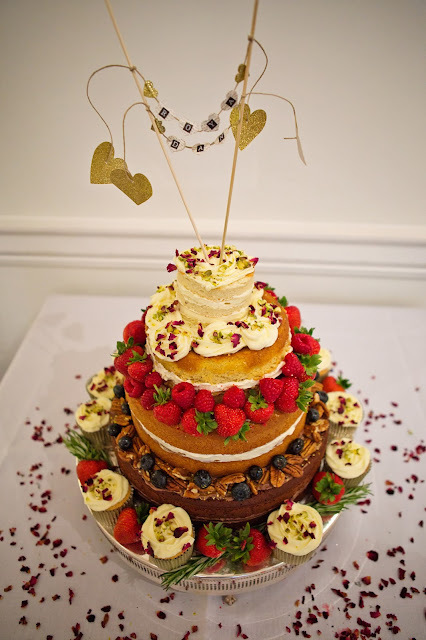 I've made truffles before (and yes I cheated a bit then too), so I thought I knew what was involved, but Lisa had a few tricks up her sleeve which meant we could produce our very own handmade, beautifully decorated truffles in less than two hours. Firstly the cream was cold. Really really really cold. We mixed one part cream with two parts melted chocolate (we added extract of peppermint) and then beat the bejaysus out of it, somewhat slowly at first, and then it really needed some welly - thanks to Sally and her super strength. This mixture was then rustled into a piping bag and again some, er, strain, was required to pipe it out into... shall we say... pipes. It tasted delicious I promise. It looked... not so much. 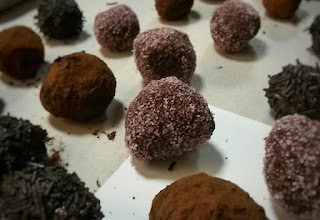 However, poop jokes aside, we rolled the truffles (fingertips) and dipped them in melted milk chocolate and/or a choice of coating (cocoa powder, raspberry fizz, and vermicelli sprinkles), and they were ready! No sticking them in the fridge to set, no waiting around for hours licking your fingers. (Well, there was a bit of that!). Such a fun evening. Lisa is an excellent teacher, dealing with spillage and poop jokes better than any Reception teacher. If you are in London this weekend and want to combine some fashion and food (I can recommend it, it's fun) pop into Topshop on Oxford Street on 24th, 25th, and 26th March, and see the Topshop girls on bikes giving out fudge and tokens. If customers spend £25 in store they can pick up some hand-rolled truffles with a choice of 10 toppings at The Cocoa Box Pop-Up stand. If you are a proper fashionista, take a peek at the FarFetch website where over 400 independent boutiques from around the world are curated in one online shopping site, showing that cultural diversity comes from uniting the perspectives of many unique individuals. This event took place on the day of the Belgium bombings. I wish that the people responsible would let go of their narrow-minded belief that their way is the only way. Live and let live. Be who you are and let others do the same without judgement. My thoughts are with those affected and their families.